Kristapor delivers an exceptional lesson experience and ranks in the top 15% of our teachers nationwide. • Maintain an active and successful career in composition; have written music for some of the most sought after performers in the country. • Perform with world-class artists across the United States as well as internationally. • Perform and record in multiple idioms, ranging from concert music to blues, folk, and rock. • Created meaningful connections with students, nurtured their talents, and helped them express their individuality through music. • Taught a variety of subjects, including violin, guitar, and music theory. • Worked with the CEO to assist in recital planning, preparation, and recording. • Provided outreach through musical performance and education to various communities throughout the Los Angeles area, notably elementary schools and retirement homes. • Coached individuals and ensembles on music fundamentals. Provided private instruction to adolescents who might otherwise not have the resources. • Brought enrichment and meaning to people’s lives, including my own, through the power and generosity of musical education. With the Kavafian sisters, Ida, and Ani. With esteemed composer Tigran Mansurian. 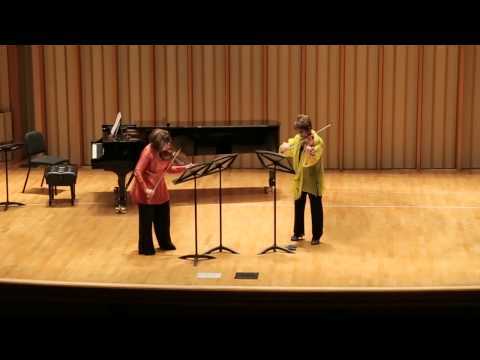 World premier performance of my 'Tale for Two Violins', premiered by the renowned violinists Ani and Ida Kavafian.